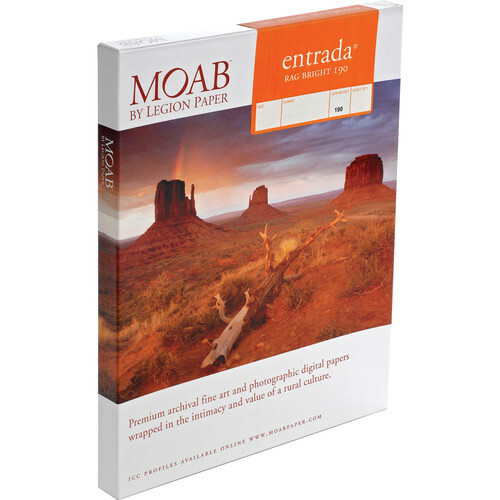 Produce fantastic prints with vivid colors and high sharpness with the matte surface of Entrada Rag Bright 190 from Moab. Machine-made from 100% cotton fiber, this double-sided paper offers superb ink handling and a traditional feel. It also incorporates some optical brightening agents to reach a brightness of 103% and a whiteness of 95%. Also, the 15.5-mil thick sheets are acid and lignin free as well as water resistant and calcium carbonate buffered in order to ensure true archival longevity. This paper is available here as a 25-pack of 8.5 x 11" sheets. Box Dimensions (LxWxH) 11.9 x 9.1 x 1.0"
Entrada Rag Bright 190 Paper (8.5 x 11", 25 Sheets) is rated 4.6 out of 5 by 15. Rated 4 out of 5 by Trapezegirl from Good paper for a newbie like me! I used this paper for printing in my introductory level digital photography class in college. We had already done some printing on matte surface paper before, so I had some idea of what I was doing, but not much. I got the Moab Entrada mostly by suggestion from my professor, even though I really wanted photo black paper, for glossier prints. I was pleasantly surprised, though, and I am happy with the results. The bright white is nice and clean looking, the 190 weight is not too flimsy, but isn't beastly thick by any means. And I really like that you can print on either side, so you don't have to worry about making a clumsy feed mistake. Rated 5 out of 5 by thatproject from Great Paper for book making I use this product to make books with photographs. As anyone who knows about bookmaking and paper art, grain direction is crucial. Moab is the only company that indicates in the back on the packaging if the box is packed with paper grain short or grain long. So you always know what you are getting. Love working with this paper, can print out double sided book pages with these Moab papers. Rated 5 out of 5 by Anonymous from Great Paper I use the Entrada series of papers on a regular basis. I have found them to be an excellent media for my epson 2880 prints. In general, the prints are a close match for the B+W images on my monitor. It is important, however, to refine your print settings to achieve consistent results. I have not had good success with the Moab provided ICC profiles and instead use Epson's recommended print procedures. I haven't had any dust issues with the paper and prints have retained their color and saturation when exposed in sun for lengthy periods of time. Rated 4 out of 5 by Uncle Earl from Great Surface I've been making my Christmas cards each year using this Entrada paper with almost excellent results. I've printed from the Canon 9000 II (dye based) and the Epson R2800 (pigment). Both produce excellent tonal range, accurate color and sharp images without bleed. The Canon Profile still tends toward magenta and needs some tweeking. The only problem is with duff so if you're doing something that can't be touched up, you need to sweep off each surface before you print. And make sure you don't get duff in the printer. Rated 5 out of 5 by Dalton from Great paper for black and white or color I have tried many different papers over the years and come back to Moab Entrada Rag again and again. It is my favorite matte paper. It has a beautiful surface, profiles well, and looks great under glass. I prefer the Bright White for color photographs, and the Natural for black and white photographs. Rated 5 out of 5 by Robert from A Real Rag This is the most luscious print paper ever. It's like engraving paper and feels great in the hand. Images, especially B&W images, are meant for it. It is my B&W paper of choice. The best. You can even sign your work in pencil! Rated 5 out of 5 by Anonymous from Beautiful and Professional Paper Printing on this paper takes my photography to a whole new level. The paper is art itself and when I printed my images on it, I wanted to create endless prints because it so rich in color and feel. Rated 4 out of 5 by Shocktart from Nice Paper This paper was a bit to thin for what I wanted it for but I should have compared the paper thickness better. It is nice though if you're looking for a thinner card stock.